It’s amazing how tolerable James Franco becomes when he’s working with Seth Rogen. It might be Rogen’s ability to bring out the best in anyone, or maybe it’s seeing their real friendship bleed into their performances together, but when Franco is working opposite Rogen, I almost forget about his Instagram and scamming underage girls. 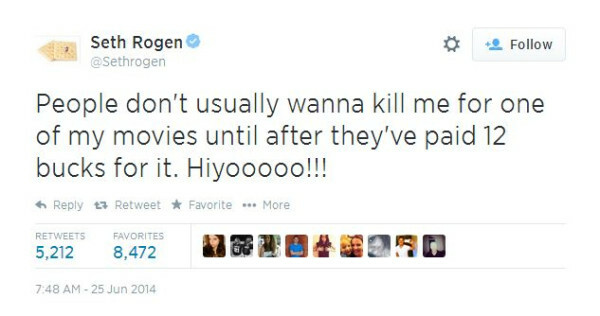 The Franco that shows up around Rogen is the Franco I’m familiar with—funny, goofy, capable of laughing at himself. I don’t know where that guy goes the rest of the time. It’s one of the great 21st century mysteries. 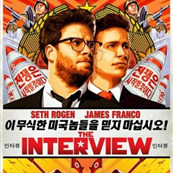 In the tradition of This Is The End and Pineapple Express, Franco and Rogen are re-teaming for The Interview, a comedy about dippy LA “journalists” who bag an interview with North Korean dictator Kim Jong-un, which prompts the CIA to recruit them for an assassination attempt. Wacky hijinks ensue. It’s supposed to be fantastical, but that actually sounds like something the CIA would try, given half a chance. Franco and Rogen play the journalists, Lizzy Caplan (!!!) is the CIA agent, and Veep’s Randall Park plays Kim. The trailer is very funny—Rogen and his partner Evan Goldberg are proving to be not only great comedy writers but also talented directors. 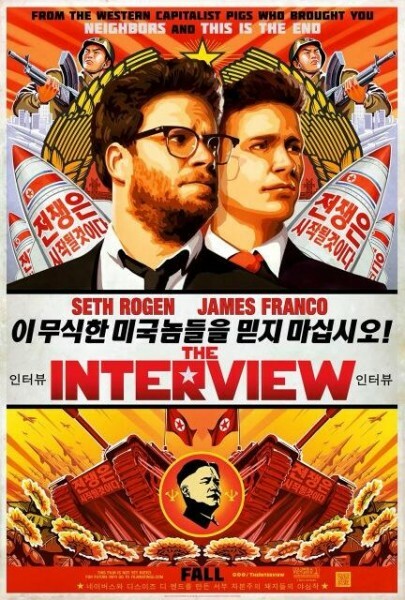 But the movie is not without controversy, mostly because Kim Jong-un is not known for his stellar sense of humor. As far as North Korea is concerned, this movie is an act of war “masterminded” by the Obama administration, and if it is released in October, they will retaliate with a “decisive and merciless countermeasure”. (THANKS OBAMA.) This kind of thing has happened before, most notably when Trey Parker and Matt Stone made Team America: World Police, and gave us puppet Kim Jong-il. …But that’s it. So no, it won’t affect the movie in any way, personally I think Kim Jong-un is fair game—we routinely lampoon presidents on SNL, so what’s the difference, really?—and I very much look forward to seeing The Interview in October. Update: North Korea has fired rockets into the sea. They haven’t confirmed if this is because of The Interview, or if it’s just Thursday.